CHARLOTTE, N.C.--(BUSINESS WIRE)--Heart-shaped products are everywhere this Valentine’s Day, but for a truly unique, original sweet treat, turn to Bojangles’ and our delicious, one-of-a-kind Heart-Shaped Bo-Berry Biscuits, now available through Thursday, February 14. Nothing brings joy to your heart like a warm, freshly-baked Bo-Berry Biscuit. Each Heart-Shaped Bo-Berry Biscuit is expertly made from scratch by a Bojangles’ biscuit maker, using the brand’s proprietary 48-step biscuit-making process. 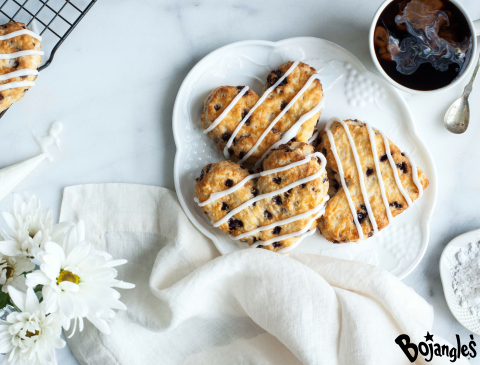 With Bo-Berries baked inside and a decadent vanilla icing drizzled over each biscuit, we’ve created a delightful sweet biscuit that also pairs well with a cup of our Bo’Town Roasters™ coffee. Enjoy a Heart-Shaped Bo-Berry Biscuit for breakfast, as a midday pick-me-up or dessert, but remember, these lovely-shaped biscuits will only be available through February 14. This Valentine's Day, celebrate with Bojangles' Heart-Shaped Bo-Berry Biscuits, now available through February 14.